The program explains and prescribes what personnel do and who does what, how, when and why? The personnel involved are more than those in maintenance. They also include all who support maintenance, such as warehousing, or depend on maintenance services, as with production. 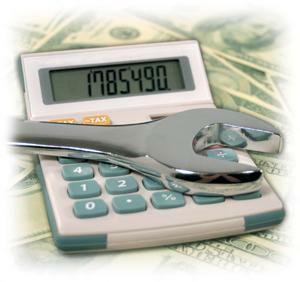 The success of all maintenance functions is enhanced with a program commonly understood across the entire operation. But, the most important aspect of all is to ensure that those other departments that must support maintenance or utilize its services know how. If they don’t know what maintenance wants and needs, they cannot deliver it. There is an axiom that suggests: If you want someone’s help, you must first tell them how they can help. More simply: No tell; no help. Maintenance is not a stand-alone effort. Any successful effort to improve maintenance performance, regardless of how, depends on the quality of the plant maintenance program. It’s important to note that it is the plant maintenance program, not the maintenancedepartment’s maintenance program. Maintenance is a service provider, dependent for success on the cooperation and support of all other plant departments and the backing of a supportive plant manager. Maintenance is not to be carried out single-handedly by maintenance. Planning, for example, is a key maintenance function and the responsibility for successful planning rests solely with maintenance. But, the planning function requires the support of numerous plant departments, like warehousing, purchasing, shops, accounting, etc. Few maintenance functions are successful without help and cooperation from other departments. Only the plant manager controls all departments. Therefore, the existence of a quality plant maintenance program is the responsibility of the plant manager. However, the maintenance manager is responsible for the effective execution of the elements of the plant maintenance program. Yet, the maintenance manager depends on all other departments in order to execute the plant maintenance program. Thus, the plant manager becomes responsible for ensuring the support and cooperation of other departments, which, in turn, ensure the success of maintenance. What must the plant manager do? Based on the corporate business strategy, the plant manager, as shown in Figure 1, develops a business plan (1), assigns departmental objectives specifying responsibilities for primary operational or support activities to include interactions with maintenance (2) and specifies policies for the conduct of maintenance (3). In turn, departments acknowledge objectives and follow policies as they incorporate all experiences with merit (4) and follow principles (5) to develop internal and interdepartmental procedures (6). Procedures are then incorporated into departmental programs (7) and information systems utilized to control actions (8). Once tested, departments organize to support programs (9) and interact according to approved program details (10). Thereafter, information is used to control and manage the overall operation (11). It follows that the best maintenance organization must be capable of executing the what, who, how, when and why of the plant maintenance program. And the best information system is the one that provides the right information to ensure efficient execution of the what, who, how, etc., specified in the program. It is reasonable to state that modern strategies, like reliability centered maintenance (RCM), cannot be successfully implemented unless there is a plant maintenance program, organization and information system to support them. It logically follows that only when a plant and its maintenance department have solidly locked down what they do, how, etc., can they confidently choose the best organization and a competent information system to carry out and control plant maintenance activities. Program definition begins at the plant manager level. This individual states how the departments should work together efficiently and productively by assigning specific objectives. The plant manager provides policies so departments are guided as they develop internal and interdepartmental procedures that make the plant’s maintenance program work efficiently. Effective maintenance and actions that assure reliable equipment and workforce productivity don’t simply happen! They happen only after clear, logical management guidance is provided and a quality program emerges. Program definition is a composite interaction of all departments. As they work together, maintenance crews, equipment operators, supervisors and staff personnel, like planners, warehouse personnel, or purchasing agents, should confer as the procedures for each department are being developed and interdepartmental actions confirmed. This collaboration better assures the practicality and workability of the final program. Program education is essential and must include everyone in the plant, from worker to manager. Plant managers should make a special effort to observe the discussion between departments as they commit to procedures necessary to carry out the plant’s business plan. Questions should be answered promptly and correctly. Recommendations should be welcomed and encouraged. The most effective technique for documenting the program is a schematic diagram that depicts the interaction between individuals of participating departments. The schematic is accompanied by a legend to aid understanding of the step-by-step process. While other techniques, such as flow charts, decision trees, or narratives, with diagrams might be used, none are as effective as the schematic diagram in showing people’s interactions. The schematic pinpoints ‘you’ and ‘me.’ It describes directly what ‘we’ must do, how ‘we’ will do it and the results ‘we’ should achieve. It is this ‘personal’ explanation that helps to bind people to the program. As Figure 2 illustrates, preventive maintenance (PM) services due are shown by the information system (1). Services on equipment due (2) are either static (require shutdown) or dynamic (done while running). Static services are integrated into the weekly schedule and operations is advised of the approved, scheduled shutdown times (3). Dynamic PM services are done at the discretion of the maintenance supervisor (4). The maintenance supervisor assigns PM services to individual crew members (5). Services are performed by maintenance crew members (6) and crew members confer with operators to learn about actual equipment condition (7). Operators assist according to their instructions (8), while operations supervisors are advised of new deficiencies by the crew member (9). Deficiencies are then reviewed by the maintenance supervisor and the crew member (10) and converted into work as follows: Emergency repairs - Supervisor assigns at first opportunity (11); Work that meets planning criteria requiring planning - Supervisor forwards to planner (12); and Unscheduled repairs - Crew member enters them into the work order system as new work to be fitted in at first opportunity (13). It is always prudent to ensure that everyone in an industrial organization understands their operational, support and cooperative roles and responsibilities. When this happens, the plant maintenance effort will be successful. Paul D. Tomlingson, retired, is a 44 year veteran maintenance management consultant focusing on heavy industry. Mr. Tomlingson is the author of eleven textbooks and over a hundred published trade journal articles. He is a graduate of West Point and received a BA in Government and a MBA from the University of New Hampshire. A successful training program is built from clear and comprehensive job descriptions that define the expected tasks to be performed by the employee and the expected behaviors to be demonstrated by the employee. Many organizations are reluctant to write job descriptions for fear that employees will use the document as a way to avoid taking on additional responsibilities or refuse to get involved in special projects. In actuality, a detailed job description provides the employee with important information that enables him or her to quickly acclimate to a new environment by clearly and precisely stating the expectations for task delivery and behaviors. Task functions and responsibilities — Clearly delineate all job functions and responsibilities as they relate to the performance of the employees duties. This would include technical aspects of the position, supervisory or managerial responsibilities (if applicable), communication skills and experience requirements, and back-up functions such as "other functions as deemed necessary by circumstances." Performance standards — Indicate productivity and quality standards required for the individual to be successful in his or her new role. Job-related skills — List the level of skill, knowledge, experience and capability demanded by the job, including any technical skills; physical requirements such as repeated lifting, pulling or pushing and physical exams that must be passed prior to qualifying for the position; communication skills such as written, verbal and language requirements; and interpersonal skills such as customer interaction, strong team player skills and the ability to work harmoniously with a diverse workforce. If the job requires computer skills, indicate the hardware and software that the employee will be using and the minimal skill level and/or experience required with the hardware or software. Scope and limits of authority — Outline the areas of responsibility assigned to each person, including where duties may overlap and who is ultimately responsible for the finished product or service. Also, specifically describe the level of authority the person has over other people, the function or the product. Management expectations — It is impossible to get results unless you spell them out. These should include expectations for availability such as overtime, nights, weekends, holidays, etc. ; flexibility in scheduling regarding off days; restrictions on vacation time; policies and accountabilities for tardiness and absenteeism; and expected employee behaviors regarding interaction with peers, customers, vendors, managers and others. Relationships — Clarify the reporting structure for each department or division, stating to whom the employee reports or who reports to the employee, if applicable. Also, if team or group projects are required, give an example. Whether you make the job description available to the potential employee during the application process prior to the interview or present it during the interview, the employee should have ample time to review and reflect on the job requirements on which he or she will be expected to deliver. The preferred method is to make the job description available with the application. This gives the applicant enough time to formulate questions that he or she may want to ask during the interview. Most importantly, once you have made the job offer, have the new employee sign the job description. This allows you to hold the employee accountable for delivering on all aspects of the job and avoid the "that wasn't in my job description" scenario. If you ultimately hire the person, the signed job description is placed in his or her personnel file. In our competitive environment, every manufacturer struggles to do more with less and to find capital for "nonproduction" areas, such as maintenance, safety, training, housekeeping and human resources. If done in a short-sighted fashion, the employer learns through painful experience the sacred law of "unintended consequences." A recent magazine article detailed the harm to production and profits that resulted from gradually shifting almost all maintenance functions to production employees. You're probably thinking, "I wouldn't do that," but many employers have eliminated certain housekeeping workers and relied upon production employees to clean up their area or machine. At one company, management of change (MOC) was overlooked as conveyors were modified and used machines and lines were added. Overstretched plant engineering and maintenance departments missed the new point of operation and other areas requiring guarding. Interlocks were not connected. Holes were left in boxes and panels. Lockout training was not updated. No annual evaluation of lockout was connected, and training was not revised. After an injured line employee complained to the Occupational Safety and Health Administration (OSHA), the agency issued hundreds of thousands of dollars in citations and penalties relating to guarding, lockout, training and electrical violations. 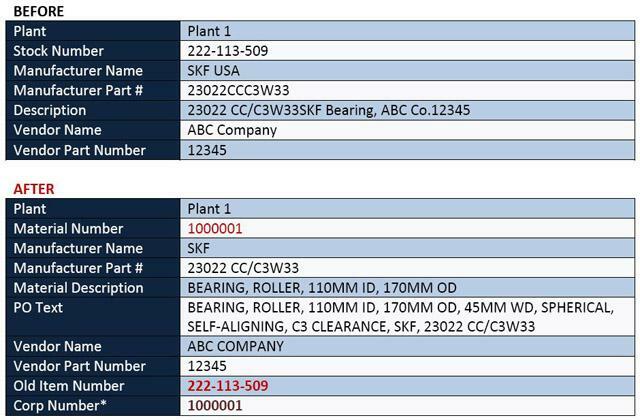 Even worse, the company has significant "repeat" citation OSHA exposure throughout its many plants. At another plant, the overall safety responsibility was shifted to a production supervisor (or maintenance or lab director, etc. ), and the plant safety manager was laid off. The supervisor/safety manager responded to the loudest voice (the production manager) and the seemingly most urgent matters (getting product out the door). A worker was killed but not "directly" because of safety lapses (a poor safety culture was a factor), and OSHA learned that new hires had not received proper training. Written policies looked good until the company terminated the safety manager, so the decline in compliance was even more glaring. The poor pseudo safety manager was so underwater that he never acted on the recommendations from the last three yearly audits by the insurer, so OSHA cited the employer for numerous willful citations. A third company didn't feel that it could retain additional experts and relied on its own staff and its general mechanical contractors to select and install new food production lines. These individuals were actually solid people, but they did not have experience with the process hazard analysis (PHA) experience in selecting and operating lines with combustible dust issues. After several hundred thousand dollars in OSHA citations and retrofitting costs, the organization now wishes it had spent the money on a full-time safety manager and used a consulting engineer with combustible dust experience to address system design and management of change issues. These are safety and engineering-related "unintended consequences." Don't get me wrong. I embrace the lean movement and realize that sometimes you have to select the "least bad option," but you must also think ahead. Electric conductivity is a measure of a fluid’s electrostatic chargeability. It usually is expressed in picosiemens per meter (pS/m). In addition to the type of fluid, conductivity also depends on the concentration of movable charge carriers. For example, pure distilled water is only slightly conductive. However, if the water contains impurities such as salts, acids or bases, then its conductivity increases. Lubricants are normally only slightly conductive and therefore can work as insulators in transformers or switches. However, oils can also conduct electric current. Their conductivity is dependent on several different factors, including the base oil, additives and polarity. The more polar a lubricant is, the less refined and more conductive it is. Based on the manufacturing method and level of refining, the American Petroleum Institute (API) has classified base oils into five groups (see Table 1). The lightly refined, mineral-oil-based base oils of Group I represent the simplest option and previously accounted for the largest proportion of lubricant production. Over the last few years, that proportion has been in steady decline, as the more refined base oils of Groups II, III and IV are increasingly being utilized for modern lubricants. This trend of using more refined base oils and synthetic alternatives is based on the fact that they generally have better characteristics such as higher aging stability. However, while the higher-quality base oils have many advantages, there are concerns over some of their changed properties, which can lead to problems, especially when unfavorable combinations occur. One such consequence is varnish, which can be due to the base oil’s altered dissolving performance with regard to aging and reaction products. Another consideration is component and lubricant damage, which can be caused by electrostatic discharges. The lubricant’s conductivity is an important factor in the charge buildup, and conductivity is dependent on the type of base oil used (see Table 2). Along with the base oil, additives have a significant effect on an oil’s conductivity. The higher the proportion of metal-organic additives, the higher the lubricant’s conductivity. A prime example would be metal-organic additives such as those frequently used in zinc dithiophosphate (ZnDTP). As a proven multi-purpose additive in engine and hydraulic oils, ZnDTP improves wear and corrosion protection while simultaneously functioning as an antioxidant. However, zinc is considered to have dangerous health implications, so ZnDTP should be largely avoided. This means that the oil’s conductivity decreases and the risk of static charging increases. A lubricant’s conductivity not only is influenced by the base oil and the additive package but also depends on temperature. 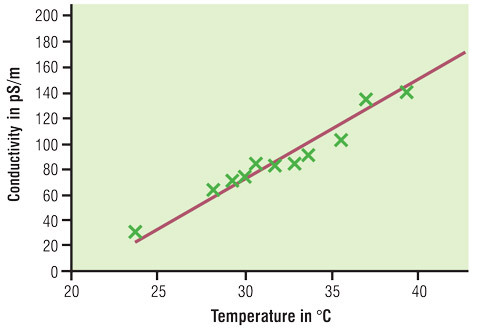 The higher the temperature, the higher the oil’s conductivity. Unfortunately, there is no linear correlation between the two parameters, as each oil type has its own conductivity/temperature relationship. Furthermore, at a constant temperature, conductivity still changes during operation due to additive reactions, wear metals, reactions with metal surfaces, water and the formation of aging and oxidation products. Although monitoring conductivity so far has been unable to achieve much success in the area of sensor technology, it is gaining significance with regard to electrostatic charges and discharges in lubricant and hydraulic systems. 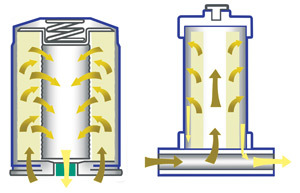 In oil-circulating systems, electrostatic charges generally can occur if there is friction in the flow between the oil and the surfaces surrounding it. The strength of the static charge depends on many different and partly interconnected factors. The energy density, which builds up in the system and leads to subsequent discharges, is contingent on the oil’s conductivity and volume flow. The more oil that flows through a circulation pipe and the lower the oil’s conductivity, the greater the potential for an electrostatic charge. It is formulated with a base oil from Group II or III. It contains no polarizing (zinc-containing) additives. The conductivity of the new or old oil is less than 400 pS/m. It is fed into pipes that are too small. It is moved with too high a flow velocity. 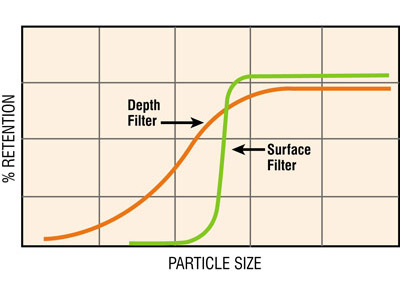 It produces friction in poorly designed filter elements. Pipes and hoses are not grounded. The oil level has dropped too low. It contains high proportions of undissolved air (bubbles). If the level of electric charge in the system becomes too great, an electrostatic discharge (ESD) will occur. In such cases, microsparks or sparking results. Typically, a crackling or clicking sound will be heard near the filter or in the tank. If the charge is high enough, the discharge could be repeated several times in quick succession. Discharges primarily take place in areas with vastly different material combinations. Modern filters with a high proportion of plastic are often affected. The microsparks caused by a static charge can lead to temperatures approaching 1,000 degrees C. This can be extremely dangerous if the fluids are even slightly flammable. In addition, if hydrocarbon vapors have formed in the tank ventilation area, the system could spontaneously combust. However, when discharge sparks occur within a turbine or hydraulic oil-circulation system, they are normally smothered very quickly by the oil. Nevertheless, these mini-explosions can burn holes in filters or even seriously damage the oil due to increased sludge buildup. Modern hydraulic fluids and turbine oils have become increasingly less conductive because of the global trend to use modern base oils and additives. 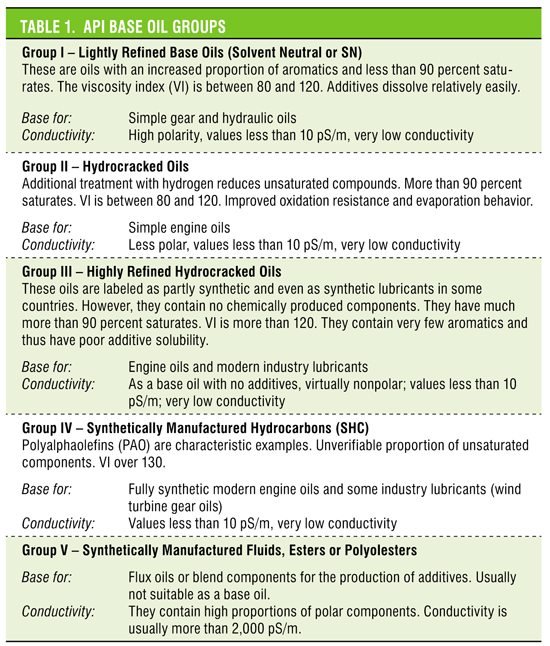 Previously, turbine oils were based on relatively conductive, lightly refined Group I base oils. Currently, more oxidation-resistant, better refined Group II base oils or even partly synthetic Group III base oils are being used, especially for gas turbine oils. These oils are considerably less conductive. In addition, turbine oils normally contain very few metal-organic additives, which help to prevent the formation of unwanted deposits (varnish). New systems feature a more compact design with a considerably smaller tank capacity and a proportionally larger displaced volume. Oil purity requirements have increased. This in turn has led to higher filtration rates. The filtration intensity and electrostatic charge properties of the oil (resulting from filtration) have increased. The oils’ low conductivity, which often is far below 1,000 pS/m in certain conditions, has resulted in an increased tendency for electrostatic charging. In order to prevent damage from electrostatic discharges, more than just the conductivity of new oil must be identified. 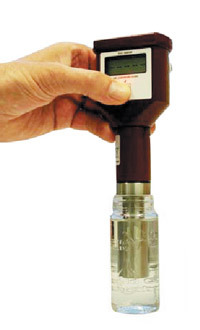 The parameter is also important for older lubricants, especially when dealing with larger quantities, if nothing is known about the used oil or a burning smell or soot particles are noticeable. Therefore, some oil analysis laboratories now offer conductivity measurements at different temperatures. The process has been tested for several years and is conducted in accordance with ASTM D2624. It originally was developed for inspecting airplane kerosene to avoid accidents caused by jet fuel charging. As mentioned previously, oil’s conductivity value is measured in pS/m. If the conductivity is more than 400 pS/m at 68 degrees F (20 degrees C), there is little risk of damage to the oil or the system from electrostatic charges. However, if the value is lower, there is a very real possibility that the phenomenon could occur. If an oil with an increased ESD risk is being used, grounding the entire system is not a viable option. The voltage inside the system cannot be discharged through a grounding wire. Fortunately, there are several other approaches for prevention. 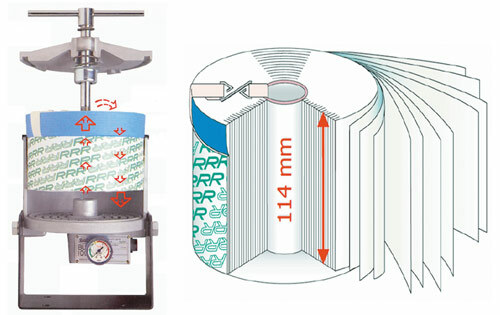 Install special stat-free filters instead of conventional filter cartridges. These filters can discharge or even prevent the charge from occurring. Use an oil with a different makeup and higher conductivity value. Choose or modify the system’s material combinations so microspark formation is prevented despite an electrostatic charge. Optimize flow diameter, tank hold times or tank volumes to minimize the charge potential. A terrorist with a bomb passes through airport screening undetected on Christmas day. If not for a failure to detonate, many lives would have been lost. When this brazen attack occurred, one of the things made evident was that many of us had let our guards down since 9/11. We had grown less interested than we once were. I recognize this in a related area of my professional life. When I am not working on maintenance systems, part of my consulting practice is in "food defense," the concept of keeping the bad guys from intentionally contaminating our food supply. There was significant interest in this topic after 9/11, as you might imagine. I regret to share with you that today there is far less interest, at least in the United States. Paradoxically, workshops I have taught in Peru, Thailand, Panama and the Caribbean have received considerable interest from their governments, universities and food industry (factories). I have a couple of theories why corporate America is so short-sighted. One is that our public-company, quarterly-results-driven world trains us to think and work short term instead of long term. The other is related to a term no longer in vogue but recognizable to all of us in manufacturing: the "flavor of the day." I think this phenomenon has gotten worse in our current downsized economy. We have cut beyond the fat into the bones of our organizations. We have let so many people go that we can barely do our daily work and certainly don’t have the means to pursue more than one or two improvement initiatives. So we went from responding to the airline terror of 9/11 and food terrorism concerns to the bird flu preparations, to the swine flu response and to the economic downturn. At each juncture, we left behind an unfinished plan or a newborn program left to die of atrophy. This was without malice but also without the energy and resources to keep multiple programs sustained. We have seen the same with industrial plant maintenance. The total productive maintenance and condition-based maintenance initiatives of the 1980s were never finished or sustained. They were replaced with the proliferation of product forms in the booming 1990s, the packaging initiatives of the early 2000s, the "green" initiatives of recent years and the cost-saving cuts of the past few years. As a result, many of our maintenance programs have failed to advance in the last 20 years. We need to learn from the airlines, which have largely sustained robust maintenance and reliability programs (albeit under Federal Aviation Administration regulation). We cannot let our guard down — not in our preparations against terror in the skies, not in our defense of the food supply and perhaps, with less life-threatening drama, not in our maintenance and reliability initiatives. Every organization has rude customers, operational and financial challenges, and employee turnover. However, the tough economy, the feeling that job stability is a thing of the past, the ever-decreasing benefits and bigger workloads have created an atmosphere of malcontent and distrust within the employee ranks. Unfortunately, most company executives are too far removed from the front line to realize that conditions are ripe for a tsunami of turnover when the recession ends. Supervisors on the front line are busy scrambling to keep their own jobs and are just as frustrated, worried and exhausted as their employees, creating an environment of "every man and woman for themselves!" Across America, 45 percent of workers say they are either satisfied or extremely satisfied with their jobs. Only 20 percent feel very passionate about their jobs. Thirty-three percent believe they have reached a dead end in their career. Twenty-one percent are eager to change careers. Older workers are the most satisfied and the most engaged in their work. Younger workers are the most distressed and feel the least amount of loyalty to their employers. Small-firm employees feel far more engaged in their work than their corporate counterparts. Job security, health-care coverage and professional development are valued above additional compensation. Approximately 65 percent of respondents said they were “somewhat” satisfied, but less than 15 percent said they were “extremely” satisfied. Meanwhile, employers believe that 30 percent of their workers are “extremely” satisfied. Sixty-five percent of employed survey respondents said they are looking around (up more than 17 percent this year). Sixty percent said they plan to intensify their job search over the next three months despite the economy. Nearly 80 percent of responding managers do not believe that their employees will initiate a job search in the next three months. One reason for this disparity in actual worker satisfaction and managers’ perception of worker satisfaction may be that employees are putting on a “happy face” to ensure that they do not lose their current job. The question then is, "What happens when the job market opens up and new opportunities become available?" I believe that many companies will experience a mass exodus of employees. A recent survey of 5,000 U.S. workers found job satisfaction to be the lowest in two decades, with interest in their work down 18.9 percent, job security down 16.5 percent, interest in the people at work down 11.6 percent and satisfaction with their supervisors down 9.5 percent. Take a few moments to really look at your employees. The telltale signs of disengaged employees are obvious. Disengaged people exist in all types of businesses, across all industries, and they have always been there, just not in the numbers often seen today. You can spot them by their indifferent, blasé attitudes. They don’t care about the company. They probably don’t like their jobs. And, they send negative signals everywhere they go. Disengaged people are like poison. They don’t perform their own jobs well. They drive customers away. They have a bad influence on your other staff. Often, they are the cause of conflict and/or low morale within the ranks. Yet few people start off disengaged. It’s typically a process that happens over time, as employee and employer expectations grow further and further apart. The challenge with the disengagement process is that it can happen slowly and subtly. Usually, there are no big red flags or loud alarm bells that announce the growing discontent of employees. Conversely, engaged employees go above and beyond their job descriptions to get things done. They’re committed to the organization’s success, and they’re willing to take on additional responsibilities to ensure that the company is successful. They feel like part of the team and have the “all for one and one for all” attitude. The benefits of creating an engaged workforce are clear. An engaged workforce drives customer loyalty, reduces conflict in the workplace, increases productivity and improves profitability. At first blush, creating an engaged workforce may seem like an overwhelming task. The good news is that it is neither extremely costly nor complicated to do so. Take pride in their work, delivering quality performance, product and productivity. Deliver exceptional service to customers, driving customer loyalty. Go above and beyond expectations on a daily basis. Perform as a team, working together toward the common goal. Intend to stay with the company. Support the company’s decisions during difficult as well as prosperous times. Clarify the Vision: It is impossible for employees to be engaged if they do not understand the vision for the future, the goals of the organization and their part in fulfilling the vision and reaching the goals. Clear Expectations: Clearly state expectations for employee results and behaviors, holding them accountable for results and behaviors. Communicate: Give them the good news and the bad news. Do not blindside employees with bad news that affects them. If you are trying to avoid layoffs and/or furloughs by cutting hours, let them know the reasoning behind your decision. Reward and Recognize: Let employees know that their contributions are appreciated. Involve the Employees: When you are facing tough decisions or experiencing operational challenges, ask for their ideas and input. Understand the Leaders’ Role: There is a direct correlation between the leaders’ behaviors and the level of engagement within the company. Leaders must demonstrate the same traits and behaviors that are expected of employees. Leaders who are open and honest in communications, are focused on employee well-being, demonstrate positive support for the organization and serve as a role model for engagement provide a positive impact on the overall morale within the employee ranks. "Improving employee engagement does not have to be overwhelming," says Mike Dolen, managing partner of Kenexa’s Global Survey Practice. "There are many ways to take small, incremental steps that lead to sustained improvement." Whether you adopt all of the steps above to engage or re-engage your employees may depend on your assessed level of engagement within your organization. Whatever you do, do something. Your employees represent your brand, and they have a powerful impact on your bottom line.